Islam Around Us: Violence claims 33 lives in Iraq. KIRKUK | Iraq |26 Sept 2013 :: Militants attacked local government and police buildings in northern Iraq with suicide bombings and mortar fire on Wednesday, sparking clashes that killed 14 people, among 33 deaths nationwide, officials said. The assault came in Hawijah, a town in ethnically mixed Kirkuk province near which security forces stormed an anti-government protest camp in April, triggering Iraq's deadliest day this year. One suicide bomber detonated an explosives-rigged vehicle near a police station, while a second blew up another near a local administrative building. Militants then hit both buildings and a local council office with mortar fire, and gunmen clashed with the army. Seven civilians, three soldiers and four militants were killed and 22 people wounded, army Staff Major General Mohammed Khalaf al-Dulaimi said. Troops were combing the area for another nine assailants who were believed to have escaped, Dulaimi added. The Hawijah assault came a day after militants attacked two police stations and a local official's house in two towns northwest of Baghdad, killing seven police and the official's brother. In the capital, six members of a single family were shot dead on Wednesday, officials said. 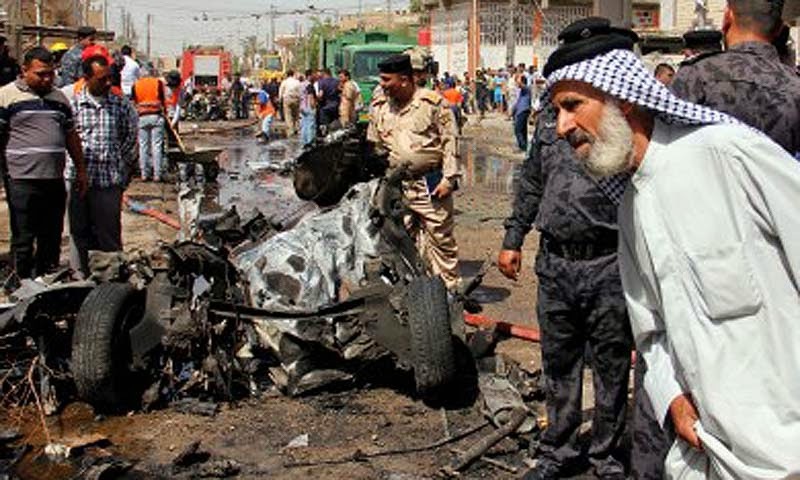 A man, his wife, their three children aged between three and six, and another woman were killed in the Shaab area of east Baghdad, officials said, while at least one person was killed and nine wounded by a bomb near a cafe in the capital. North of Baghdad, a bomb exploded near Balad, killing five people and wounding three, while gunmen killed two farmers in the Muqdadiyah area and a soldier in Taji.